6/1/2011 The artifact targeted by the second ability will retain any types, subtypes, or supertypes it has. Notably, if an Equipment becomes an artifact creature, it can’t be attached to another creature. If it was attached to a creature, it becomes unattached. 6/1/2011 If the target of the second ability is already an artifact creature, its power and toughness will each become 5. This overwrites all previous effects that set the creature’s power and toughness to specific values. Any power- or toughness-setting effects that start to apply after this ability resolves will overwrite this effect. 6/1/2011 Effects that modify that creature’s power or toughness, such as the effects of Giant Growth, will apply to it no matter when they started to take effect. 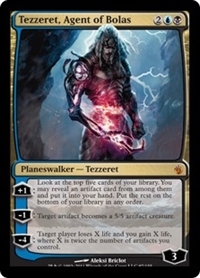 The same is true for counters that change the creature’s power or toughness (such as -1/-1 counters) and effects that switch its power and toughness. 6/1/2011 The number of artifacts you control is counted when the last ability resolves, not when it is activated.